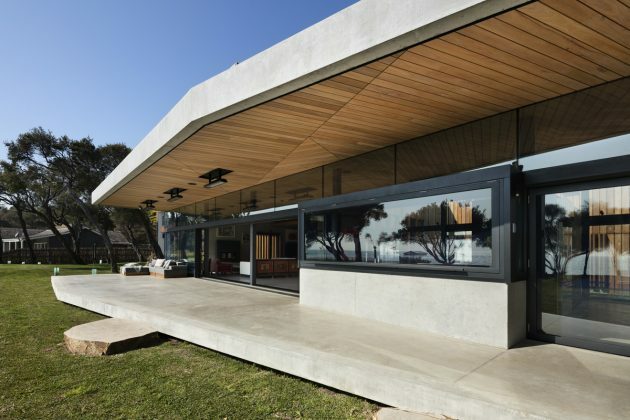 The Sorrento Beach House is a new home designed by Melbourne-based studio AM Architecture. 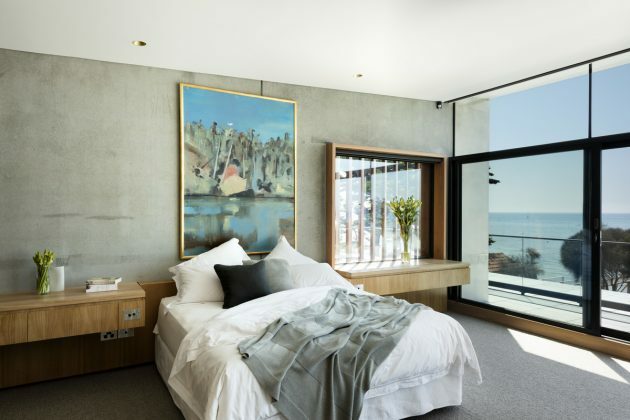 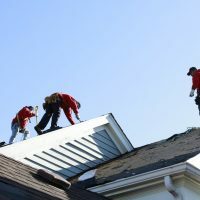 It is located on the Mornington Peninsula, Sorrento in Sullivan’s Bay to be more precise. 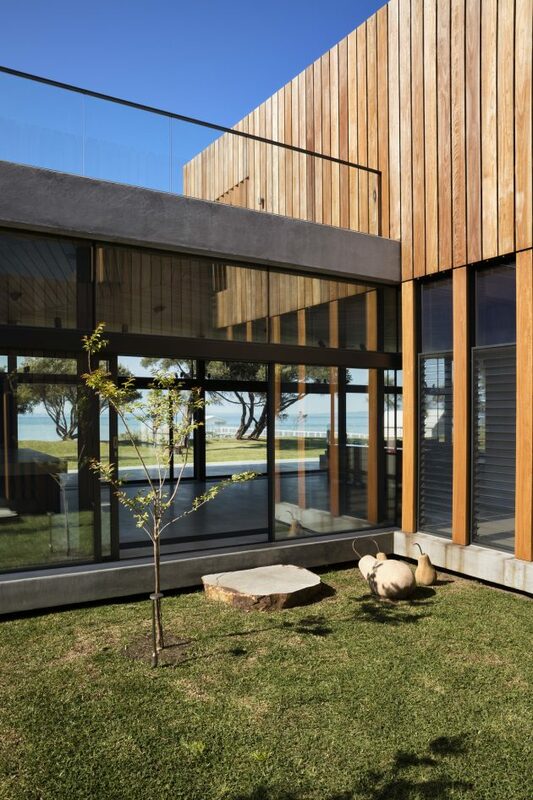 This house has a very intricate design, beginning as a plain box home that transforms into a lively beach home as it approaches the water. 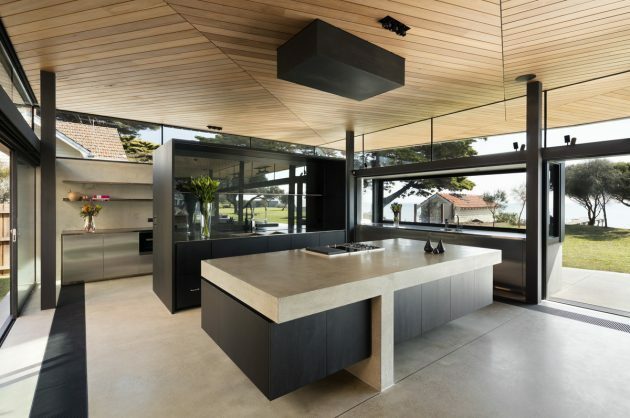 It is wrapped in a timber screen while the minimalist interior is characterized by a contrast between stark black surfaces and timber accents and lighted by sunlight that comes through the large glass surfaces that open up to spectacular views. 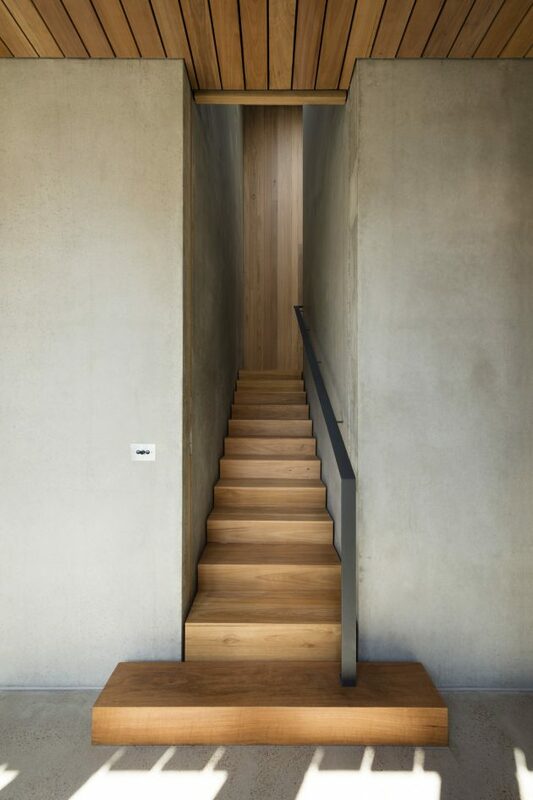 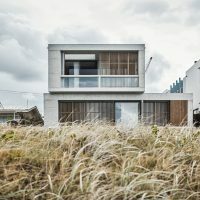 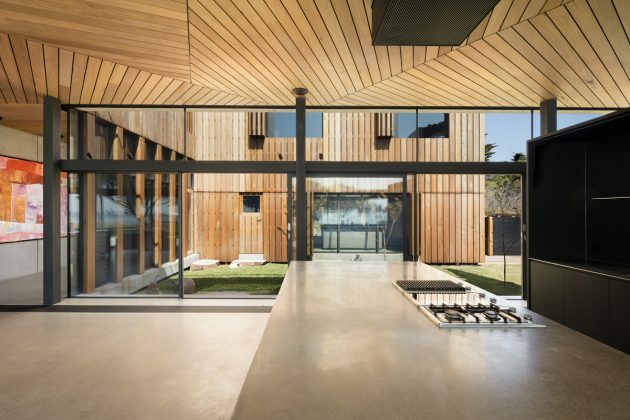 Sorrento Beach house is comprised of a raw concrete internal shell, wrapped in a timber exterior. 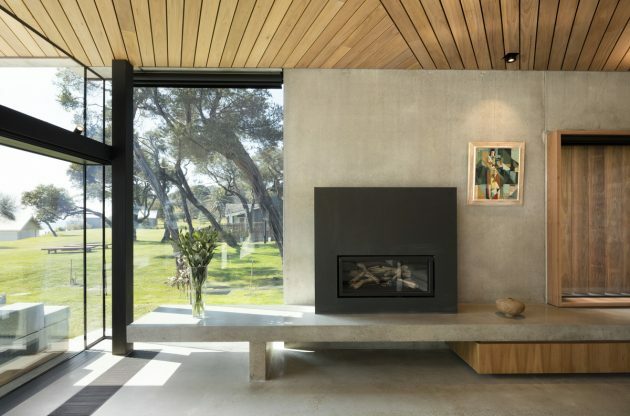 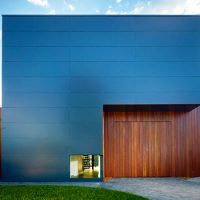 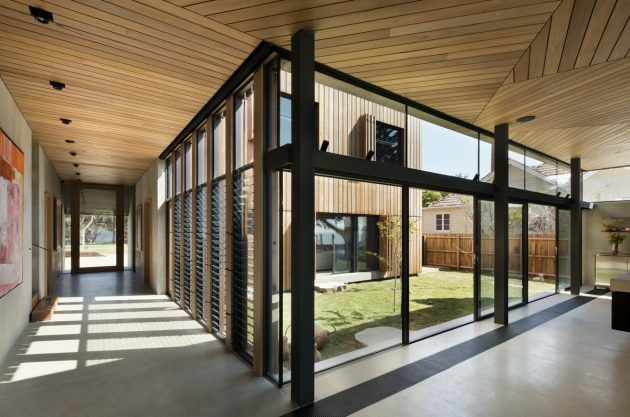 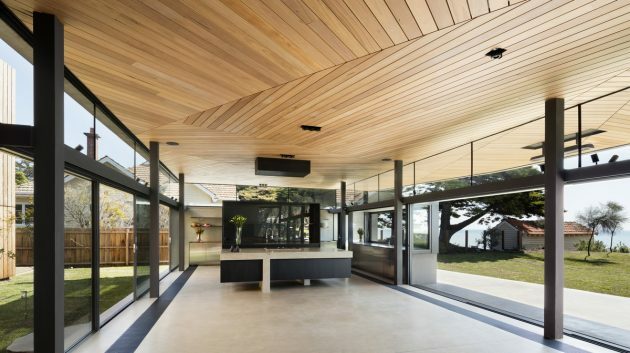 The thermal mass provided by the concrete is insulated externally providing stable internal temperatures, and the timber exterior shades the concrete, further eliminating heat loads in summer. 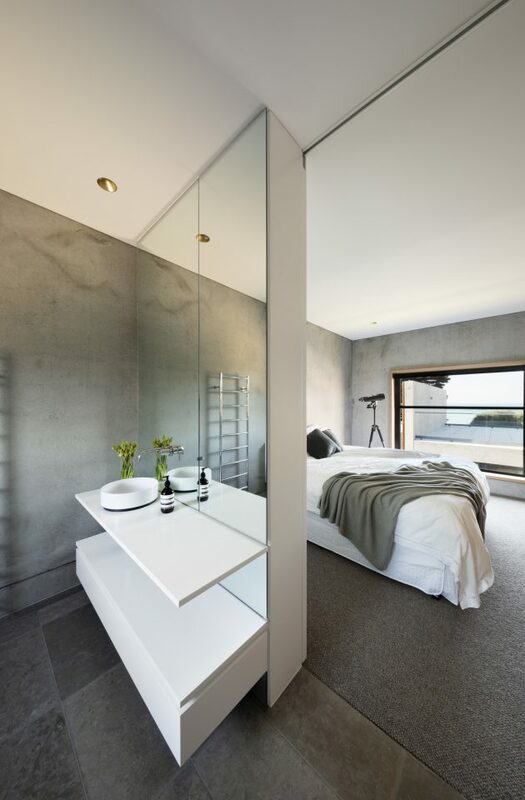 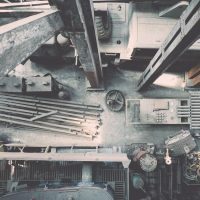 The building is designed to allow high levels of cross ventilation, taking advantage of cooling bay breezes whilst providing water views in almost every room. 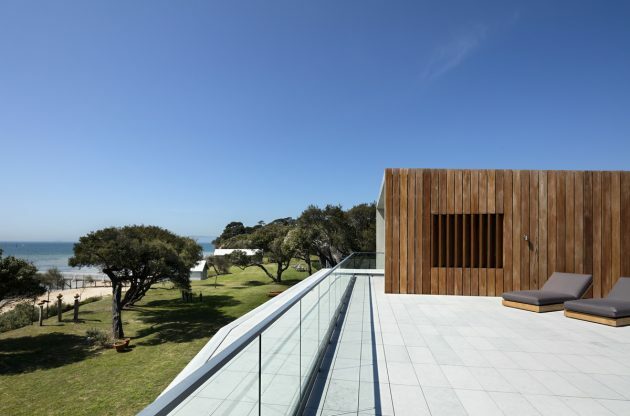 The site is located between the Sisters landforms on the Sorrento Foreshore, on a site of historical and cultural significance. 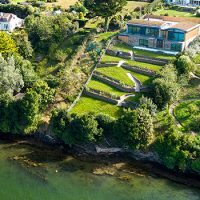 It is the landing place of the first Victorian Settlement in 1803 and well before that the home of local aboriginal communities. 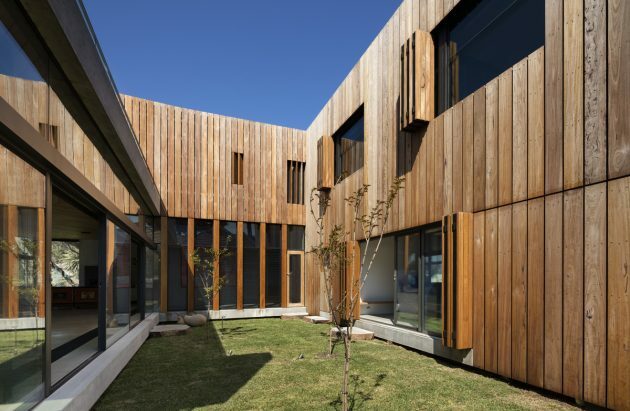 The building starts with a simple featureless timber box facing Point Nepean Road and containing the bedrooms. 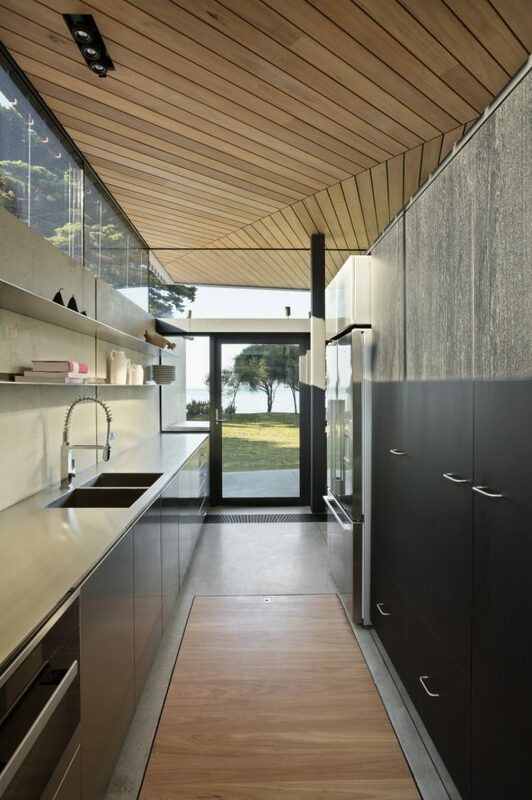 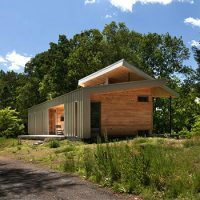 The emphasis here is on shelter and enclosure, internal surface, robust detailing, and filtered light through punched openings and screens, appropriate to sleeping day or night. 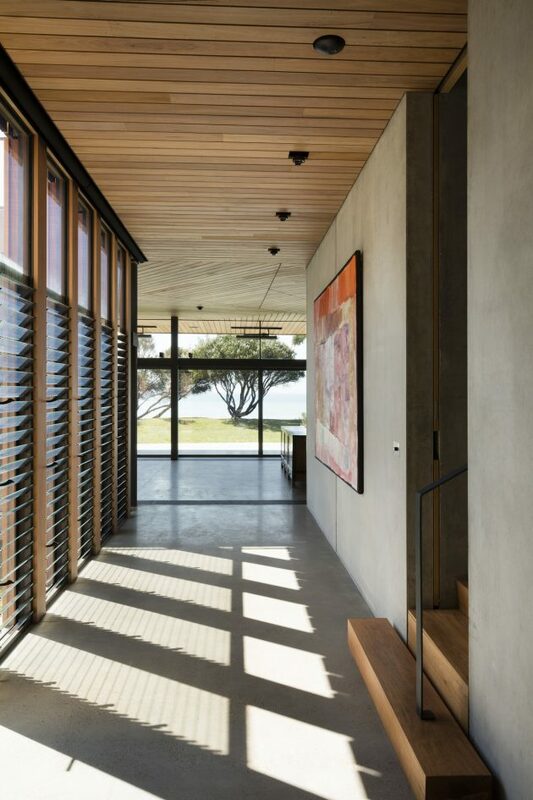 Progressing toward the living spaces the building begins to connect with the outdoors, and takes on a language of openness and less formal restraint responding to the elements around it – openness, sunlight, privacy, and the views of the foreshore. 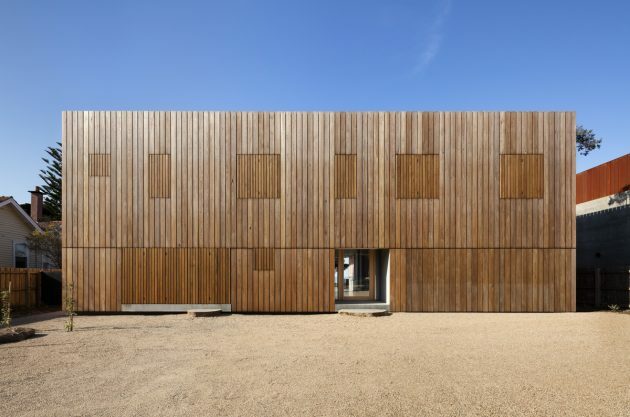 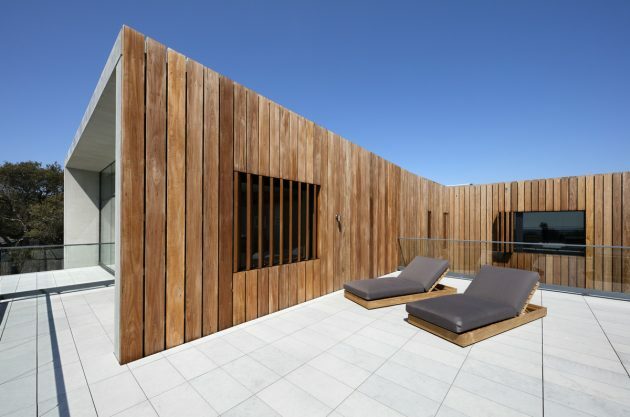 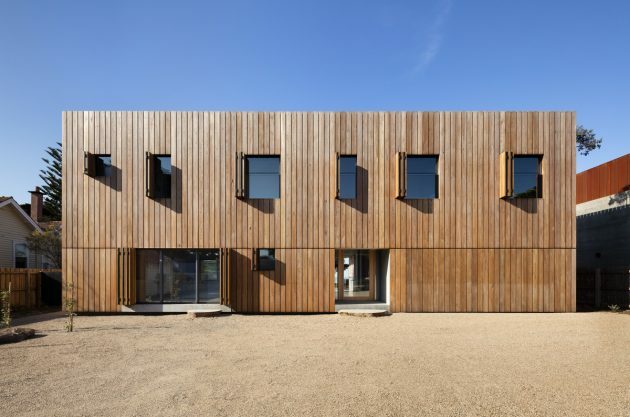 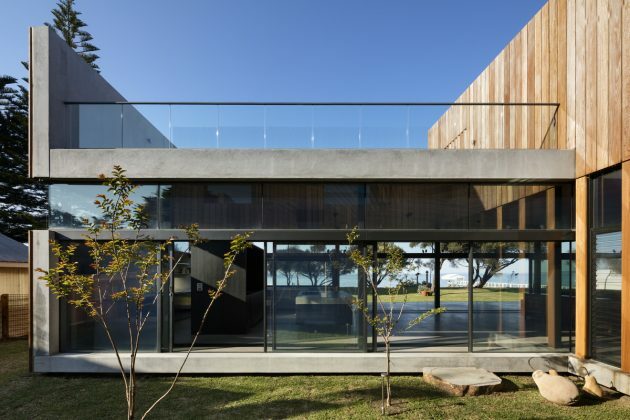 The beach side of the building takes on the angles of the shoreline and the concrete interior structure emerges beyond the timber cladding to face the harsher conditions of the water. 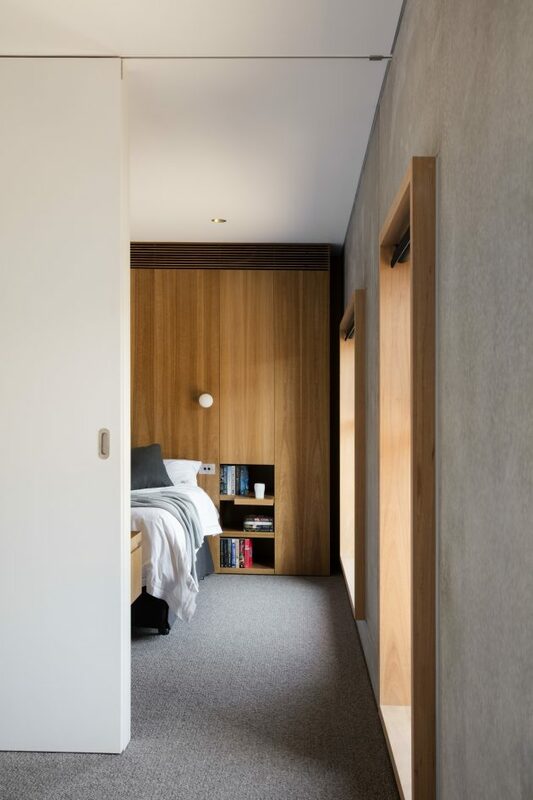 The floor shows the earthy colours of local aggregate, and the internal timber ceiling fragments into a natural crystallised pattern which align with constellations in the night sky on the eve of settlement.